Wahoo! I just announced the release date for Offspring Fling! 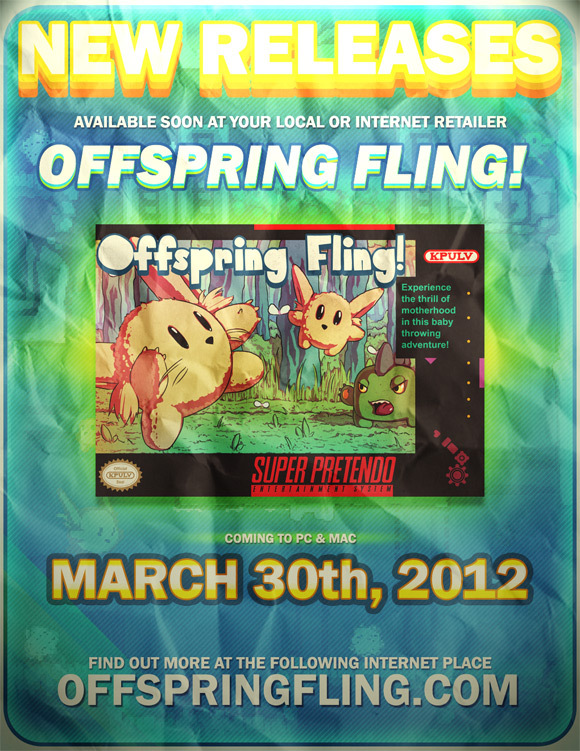 The game is coming out on March 30th, 2012, and you'll be able to get it from OffspringFling.com! I put together an image to try and promote the game's release, check it out! I wanted to make something that reminded me of the old flyers that I used to browse through every Christmas to see what awesome new games we're coming out, and since Offspring Fling is so super influenced by games I love on the Super Nintendo, it seems appropriate to market it as a Super Pretendo game. To see the full version of the flyer you'll have to go over to the Offspring Fling website. Along with the flyer, there's also a preview of the game's soundtrack from Alec Holowka. The soundtrack will be coming out on Bandcamp a little bit after the game's initial release. The time for throwing children is almost upon us! offspring fling alec holowka yay!